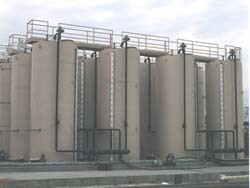 Millennium Systems International is a leader in the design and installation of tank farms worldwide. MSI specialties include Aviation Fuel Farms, Solvent & Resin Tank Farms and Military POL facilities. Automatic Tank Gauging, Product Receipt and Issues Metering, Pipeline Custody Transfer and Rail Car & Barge Unloading Systems are all available through MSI.